Summer is the time for getting out of the house: firing up the BBQ, inviting a few friends over to swim in the pool, spreading out on a lawn chair, and spending time with family on the back patio are common ways people enjoy the warm weather. Summer is also the time to host parties and throw weddings. Our back yards, our personal retreats, are worth all the hard work we put into them when we get the chance to entertain. Delicious food, lovely decorations, and wonderful company are all important parts to creating a backyard bash. 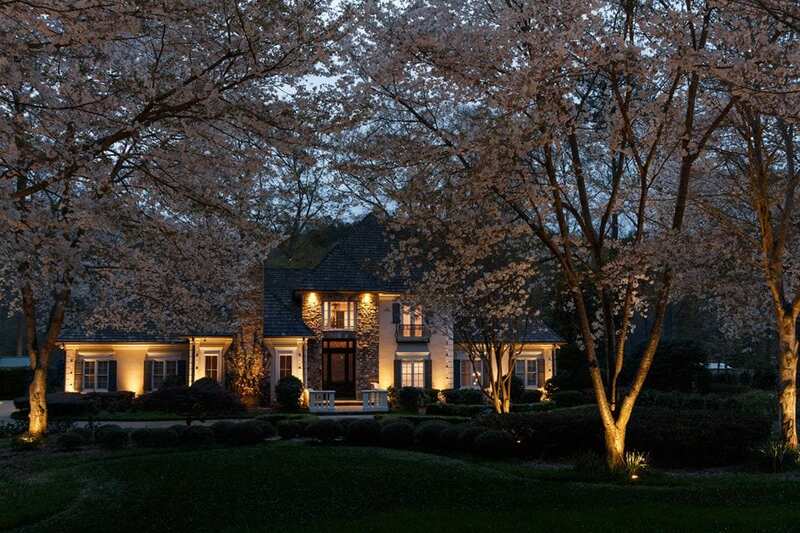 The other key ingredient that should never be overlooked is the thing that allows our parties to go on even after the sun has gone down – beautiful exterior lighting. To throw out tons of light for an event, you could have a powerful 400 Watt lamp post installed in the middle of your yard. This would throw out ample light for your guests to see everything. But most people don’t want their yards to feel like a football stadium. Lighting your landscape isn’t just about LIGHT. Imagine bathing your deck or patio with a soft moon light. Mounting fixtures high up in trees or on the soffit of your home and aiming them downward can help to create this. When down lighting is done with a gently diffused light, it can recreate a serene magic that mimics the effects of moon light. What’s more beautiful or festive than moonlight? The moon can be an incredible mood setter. The only problem is that the moon doesn’t always cooperate. While we do want our lights to be inviting, we don’t want them to scream or be too loud. Moon lighting is a stunning and subtle approach to illuminating your outdoor living area. Bistro lights (sometimes called string lights or festoon lights) are a very effective lighting approach to creating a festive atmosphere. Strung over a patio or perhaps up inside a pergola, bistro lights provide soft ambient illumination. They have become very popular these days. People are stringing up bistro lights today for their upcoming parties and backyard events. But be mindful when purchasing the LED version of these lights from a big-box store. Just because they are LED doesn’t mean they are going to be what you want them to be. The color temperature of these bistro lights often have a cool white/blue hue. This cold color temperature isn’t desirable for creating an inviting atmosphere. Warmer temperatures should be used. Be it a small get-together or a neighborhood pool party, landscape lighting really makes all the difference in the world. If you have a vision for lighting your property, talk to an expert at NightVision Outdoor Lighting today. Aren’t sure where to get started, or would like to get some ideas that might work well for your specific home, contact us directly or give us a call at 678-828-2999!